with co-instructors Wil Cruz and Raul Alcantara. Supported in part by the Washington University Biology Dept. and Becker Medical Library and by a grant to Washington University, St Louis, in support of Sarah C.R. Elgin from the Howard Hughes Medical Institute through its Professors Program. Tuesday 8/24/04: Hilltop Campus (Natural Science Learning Center, Rm. 117), 8am-4pm (12-1pm lunch break). Wednesday 8/25/04: Medical Campus (Becker Medical Library, Rm. 601A), 8am-2:30pm (lunch break 11:30am-12:30pm). Mac downloads: Netscape and Chime plug-in. Windows downloads: Netscape and Chime plug-in. Rationale & Goals: In this day of exploding bioinformatics information from genomics and proteomics, it is ever more important to be conversant with macromolecular three-dimensional structure, and how it relates to protein and nucleic acid function and drug design. This workshop will enable participants to find published macromolecular structure data, and visualize and interpret 3D macromolecular structure. Participants will be enabled to incorporate computer visualization and qualitative analysis of 3D structure of protein, DNA, RNA, and protein-ligand interactions into their teaching and research. Software:	The central tool for this workshop is Protein Explorer (www.proteinexplorer.org). Protein Explorer is free, operates on Windows or Macintosh (also linux in a Windows subsystem), and is much easier to use, yet much more powerful than RasMol. Protein Explorer won the 2003 MERLOT Classic Award in Biology for exemplary online learning resources: "The Protein Explorer has revolutionized the teaching of biology at a molecular level". Protein Explorer integrates several key bioinformatics servers, and has been adopted by numerous bioinformatics resources. Level & Pace: This workshop is designed for researchers familiar with basic biochemistry, but with no previous molecular visualization software experience. It progresses rapidly to powerful tools that will be of interest to specialists in protein structure and bioinformatics. Experienced participants are encouraged to work at their own speed, ahead of the group -- there is plenty of power to discover within Protein Explorer and its links to other resources! Day 1, Tuesday August 24. Basics. How to use Protein Explorer to visualize structural features of proteins and protein-ligand interactions. Netscape 4.8 is best, but Internet Explorer is OK. Skip the PE Demo Movies -- use them for review (if you haven't used PE for a few months) or to start friends who didn't attend this course. Click Quick-Start ... to display Gal4:DNA. 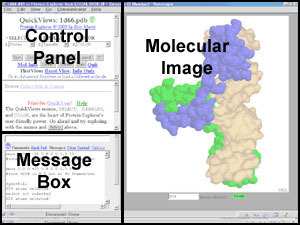 Organization of PE into 3 frames: control panel, molecular image, and messages. Use the mouse to rotate the molecule; click to identify atoms. Identify and become familiar with the computer representations for chains, backbones, disulfide bonds, solvent, and ligands. Understanding and using information provided in the PDB file header by the authors of the structure. The Help/Index/Glossary (green for "go"), a major component of PE's knowledge base. Selecting, emphasizing, and hiding portions of the molecule. Selecting arbitrary atoms/chains/residues by clicking on them. Backbone, trace, cartoon, stick, ball and stick, spacefill to van der Waals radii. Coloring by element (Corey, Pauling, Koltun color scheme). Coloring cartoons by secondary structure. Identifying the amino and carboxy termini (5', 3' ends): N->C Rainbow (Group) color scheme. Interpreting the distribution of hydrophobic, polar, and charged residues (Polarity color schemes). Potassium channel: 1bl8. Trp prefers lipid-water interface. Coloring by disorder: temperature factor coloring. How are 3D macromolecular structures obtained? Crystallography, NMR, and homology modeling. What fraction of the human proteome has known structure? A few percent. Is Structural Genomics the answer? Not in the next few years. About 10% of proteins are thought to be fully disordered to support their functions, and 40% of eukaryotic proteins have at least one long disordered region. Examples. For shortcuts and tricks in using PE to visualize epitope-paratope contacts, see step #35 in this Antibody Structure Tutorial. Insertions and non-physical gaps: 1igt. Sequence to 3D structure mapping. Finding all instances of one amino acid (e.g. cysteine). Selecting and coloring an arbitrary range of residues (see example in box at right). Probable Quaternary Structures: specific oligomers: 1k28, 1k93, virus capsids. QuickViews Boolean (scroll down in the QuickViews control panel). Example: In 1FDL, display Fab atoms contacting lysozyme, then overlay ( DISPLAY) a cartoon display of all protein. Color the cartoon by Chain, then by N->C Rainbow, then by Structure. Most representative model (via PE Site Map -> External Resources). Animation simulates thermal motion (Click "Animations" at the FrontDoor). Animations: Morphing conformational changes (Click "Animations" at the FrontDoor). Preferences in Protein Explorer (beneath the message box). Aliases for RasMol/Chime commands (beneath the message box). The Day 3 agenda will be flexible. Individual help will be available for those with special projects. Where did Chime come from? What about Fred's Folly and Byron's Bender? See early computer images, physical models including the latest by computer-driven laser-powered rapid-prototype engineering, and the latest molecular sculpture. Building a web page with hyperlinks to Protein Explorer that prespecify molecules for your teaching or research. Examples. Methods. Detailed methods. A well tested and debugged template for Chime presentations exists but is nearly obsolete. A Chime-based Script recorder within PE is nearly completed. With it, views achieved in PE can be saved (as Chime command scripts) and played back. Although not yet released, a pre-release working version is available. Support for Presentations in Protein Explorer (PiPE) remains under development and has not been released. A partial implementation of a new design has a viewable example and is downloadable. Although it is in rough shape at this time, a couple of people have already developed educational resources with it. An earlier design is now deemed obsolete and will not be supported. Aligning two or more chains or molecules, and how to view the alignment. The CE site cl.sdsc.edu/ce.html will align any two protein chains quickly and easily (but hetero atoms are discarded). DeepView www.expasy.ch/spdbv/mainpage.html can align anything (one or more than one chains), selecting any subset of atoms for the alignment (other atoms following), and retaining hetero atoms. The results can be saved as a PDB file, but will need manual editing to separate models with MODEL [N] and ENDMDL records so that Protein Explorer can distinguish the models. Gale Rhodes provides a DeepView tutorial: click on the section Comparing Proteins. DeepView beginners should start with the superb Molecular Modeling for Beginners by Gale Rhodes, Univ. Southern Maine. DeepView resources are indexed at molvisindex.org. Morphing conformational changes to view as animations in PE: see Protein Morpher. Molecular Visualization Freeware/Education email list, PDB email discussion, etc. available from molvisindex.org. Collaborations are invited that use Protein Explorer to display information about macromolecular structure, particularly information which may be the result of your research. The only example to date involving customization of PE is ConSurf. PE is used without modification by several other bioinformatics servers. § Example 1FSZ thanks to Gabe McCool. See also his presentation on 1FSZ in PE.